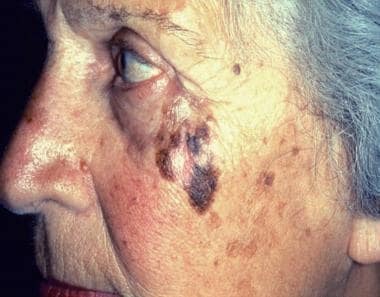 Photograph shows lentigo maligna melanoma on a patient’s cheek. 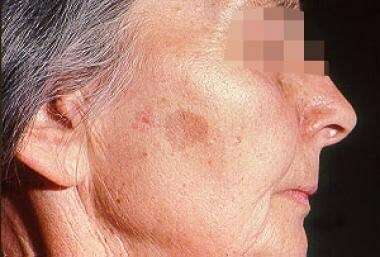 Lentigo maligna melanoma most commonly occurs on sun-exposed skin, especially of the face, in elderly persons. It is characterized by a highly irregular border, heterogeneous coloration, and—because of its long radial growth phase—a large diameter. Courtesy of CDC/Carl Washington, MD, Emory University School of Medicine, and Mona Saraiya, MD, MPH. Sir John Hutchinson first described lentigo maligna in 1890; the disease continues to be called Hutchinson melanotic freckle on occasion. The Hutchinson melanotic freckle was originally thought to be infectious because of its slow yet progressive growth. The lesion has subsequently been characterized as malignant lentigo of elderly people, junctional nevus, and melanoma in situ. Most authors currently refer to it as lentigo maligna when it is confined to the epidermis and lentigo maligna melanoma when it violates the dermis. Ultraviolet radiation exposure: For people who live in Australia, the risk increases as the number of years spent in Australia increases, as well as with increased hours of exposure to sunlight, with the amount of actinic damage, and with a history of nonmelanoma skin cancer. Many authors consider lentigo maligna to be a preinvasive lesion induced by long-term cumulative ultraviolet injury. Conceptually, the term melanoma is used when atypical melanocytes invade the rich vascular and lymphatic networks of the dermis, thereby establishing metastatic potential. Most malignant melanomas arise as superficial tumors confined to the epidermis, which is often known as horizontal growth. At some point, a stepwise accumulation of genetic abnormalities leads to proliferation and progression to the vertical growth phase, which leads to dermal and deeper involvement and, subsequently, nodal metastases. About 10% of melanomas are familial. A first-degree relative has an 8-12 times increased risk of melanoma. The major gene resides on chromosome arm 9p and encodes a tumor suppressor gene called CDKN2A or MTS1. The second gene that has been noted in melanoma prone families is CDK4, and germline mutations have been identified in this group. Patients with lentigo maligna tend to be older than those with superficial spreading malignant melanoma or nodular melanoma. Generally, patients with lentigo maligna are older than 40 years, with a mean age of 65 years. The peak incidence occurs in the seventh to eighth decades of life. Lentigo maligna and lentigo maligna melanoma are associated with higher occupational exposure and lower recreational sun exposure. As mentioned earlier, the risk of lentigo maligna melanoma increases as the number of years of residence in sunnier climates (eg, southern United States) increases, and the risk increases with increased hours of exposure to sunlight,  increased amount of actinic damage, and a history of nonmelanoma skin cancer. See the image below. A strong correlation exists between patients who report finding a nodule and diagnosis of melanoma. Although palpability usually indicates dermal invasion, clinical examination may be unreliable in early invasive lentigo maligna melanoma (lesions < 1 mm). Suspect the possibility of melanoma if a patient reports a new pigmented lesion or changes in an existing mole. About 50% of melanomas can arise from normal skin with no preexisting lesions. The review of systems should focus on symptoms pertaining to metastatic disease. Melanoma usually metastasizes to lungs, liver, and brain. Patients with melanoma need a complete and thorough physical examination, especially with focus on the skin and lymph nodes. The most frequent findings that suggest early melanoma are changes in size or color of a new pigmented lesion or an existing mole. Lentigo maligna most commonly affects the sun-exposed skin of the head and neck, with a predilection for the nose and cheek. In fact, in Australia, the lesions occur more commonly on the right side (driver's side) of the head and neck in men and on the left side (passenger's side) in women. According to the Australian road traffic database, most Australian drivers are men, and most passengers in the front seat are women. Less common sites of involvement include the arm, leg, and trunk. The conjunctivae and oral mucosa may become involved when a cutaneous lentigo maligna spreads onto mucosal surfaces. Signs suggestive of a more locally advanced lesion include elevation, burning, itching, pain, or bleeding. The simple ABCDE rule of melanoma, as follows, helps patients as well as physicians to suspect and make an early diagnosis. Lentigo maligna, the precursor lesion, has been likened to a stain on the skin. The lesion is typically tan-brown, with differing shades throughout. Assess the total number of all types of moles. More than 50 nevi 2 mm in diameter or larger indicate an increased risk for melanoma. Search for dysplastic (clinically atypical) melanocytic nevi. Irregular pigment patterns, such as variegation, central dark areas, or halos of pigment, may indicate the presence of dysplasia. Atypical nevi tend to be larger than common acquired neomelanocytic nevi, which rarely exceed 5 mm. Search for congenital melanocytic nevi. People with very large or giant congenital nevi have an increased lifetime risk (>6%) of developing melanoma. Intermediate sized (>0.5 cm), raised, pigmented lesions, with or without hair, that do not have the features of clinically atypical nevi have an uncertain but elevated risk for development of melanoma. Distinguishing lentigo maligna from its invasive counterpart on a clinical basis continues to present diagnostic dilemmas, especially in patients who had previous therapeutic interventions such as cryotherapy. It is important to have a low threshold for biopsy of pigmented facial lesions. In a series of 85 excised lesions with a clinical diagnosis of lentigo maligna, more than 50% had invasive lentigo maligna melanoma. Woman with solar lentigo. Common in sun-exposed skin, solar lentigines are benign lesions that must be distinguished from lentigo maligna melanoma. Patients with low-risk melanomas, less than 1 mm thick, do not routinely need laboratory studies. Dermoscopy is the first step that is essential for diagnosis of this lesion. The use of a dermatoscope, by a dermatologist or other physician trained in its use, can be very helpful in distinguishing lentigo maligna from other types of skin lesion. However, the dermoscopic appearance of early lentigo maligna can be difficult to distinguish from that of other pigmented lesions, particularly on the face. However, most centers order liver function tests and lactate dehydrogenase (LDH) levels as part of the initial laboratory evaluation. Serum LDH is used as part of metastasis staging (see Staging). Most institutions obtain chest radiographs in patients with low-risk disease. To determine the extent of disease, positron emission tomography (PET) scanning, staging computed tomography (CT) scanning, or magnetic resonance imaging (MRI) can be performed for patients with node-positive disease or those with symptoms suggestive of metastasis. Dermoscopy is a tool that helps the dermatologist distinguish benign from malignant lesions. It is a hand-held instrument that magnifies the skin lesion 10 times to enable a more accurate diagnosis. Ideally, biopsy of lesions should include full-thickness skin extending to the subcutaneous fat. Avoid superficial skin biopsy by shaving, scissors excision, or curettage, because these techniques do not allow for assessment of tumor thickness, which is important for prognostication and treatment planning (see Staging). A better biopsy choice would be excisional biopsy with a narrow margin of normal-appearing skin, which can usually be performed on lesions, unless the result would be disfiguring, in which case incisional biopsy is considered reasonable. Incisional biopsy is also indicated for lesions that are too large for complete excision. The type of biopsy does not influence patient survival or rate of metastasis. Previous concerns that incision into a melanoma promotes its dissemination have been allayed. The excisional biopsy specimen may be obtained by elliptical excision, saucerization, or punch biopsy, if the lesion is small enough. The specimen should include a portion of subcutaneous fat to ensure that accurate microstaging can be determined. Sentinel lymph node biopsy is done to assess regional lymph node involvement and to decide on adjuvant therapy. This technique is indicated in all melanoma patients except those with stage 0 or stage 1A disease, that is, patients with a lesion thinner than 1 mm (see Staging). If metastasis is present, a full nodal dissection is done to fully stage the disease. Lentigo maligna is melanoma in situ; lentigo maligna melanoma is melanoma. Tx – Primary tumor cannot be assessed (eg, regressed primary). Nx – Nodes cannot be assessed (eg, previously removed). N0 – No regional metastases detected. N3 - 4 or more metastatic nodes, or matted nodes, or in transit metastasis(es)/satellite(s) with metastatic nodes. Melanoma should be managed by a multidisciplinary team that includes a dermatologist, surgeon, and medical oncologist, as well as other allied health professionals. Melanoma in situ (MIS) is a noninvasive lesion. In a retrospective study of 2,121 patients treated for melanoma by Akhtar et al,  192 patients with MIS were identified; those treated with narrow margins of excision are unlikely to recur; therefore, wider excision is not required. Radiotherapy in the treatment of lentigo maligna was first described by Miescher in 1954. Other investigators have employed similar techniques with varying results. A primary risk of using radiation therapy for lentigo maligna is that it may miss focal lentigo maligna melanoma. In the presence of nodal disease, multiple chemotherapy and immunotherapy drugs have been tested. High-dose alpha-interferon remains the standard adjuvant option, especially with stage III cancer, in which it results in a 9-month increase in disease-free survival and a 1-year increase in overall survival. Vaccines have been tested in various studies, but none have led to any significant survival advantage. Granulocyte-macrophage colony-stimulating factor (GM-CSF) has been found to prolong time to progression compared to historical control in both node-positive and metastatic stage of the disease. Nonsurgical therapies have a recurrence rate of 20-100% at 5 years. Cryotherapy is not standard for the management of lentigo maligna, but it is often used in patients who are not candidates for surgery. Temperatures of -4°C (24.8°F) to -7°C (19.4°F) selectively destroy melanocytes while preserving keratinocytes in skin and mucosal epithelia. Most authors discourage using cryotherapy for lentigo maligna, because focal lentigo maligna melanoma cannot be detected clinically. In addition, cryotherapy can have complications that include hypopigmentation, infection, scarring, inability to detect invasive melanoma, and failure to treat periadnexal involvement. Topical imiquimod 5% cream has been described in many studies to be effective in treating lentigo maligna, especially in patients who are not surgical candidates. Imiquimod is an immune response modifier that offers encouraging results, but further studies are needed to identify ideal treatment protocols. Education plays an integral role in the follow-up care of patients with melanoma. Instruct patients on self-examination for new and locoregional recurrences. Teach them to recognize the classic characteristics of cutaneous melanoma in friends and family. In addition, during every follow-up visit, strongly counsel patients to avoid excess sun exposure, to use sunblock liberally, and to wear protective clothing. For patient education information, see Cancer and Tumors Center, as well as Skin Cancer and Skin Biopsy. The overall prognosis is good for patients with localized melanoma and no nodal or distant metastases. An overall 5-year survival rate of 79% has been reported for patients with stage I or stage II lesions. In patients with regional nodal disease (ie, stage III), the 3 dominant prognostic variables are the number of nodal metastases, the patient's age, and ulceration in the primary tumor (see Staging). Numerous studies have shown that the number of nodes with metastases has significant prognostic value in patients with stage III disease. Patients with 1 positive node fared the best; 40% remained alive at 10 years. Those with 2-4 positive nodes had an intermediate 10-year survival rate of 26%. Patients with 5 or more positive nodes had the lowest 10-year survival rate, at 15%. In both men and women with stage III melanoma, patients older than 50 years tend to do worse. In studies evaluating tumor ulceration as a prognostic factor in lentigo maligna melanoma, the 3-year survival rate for patients with an ulcerated primary tumor was 20%, compared with 35% for those with nonulcerated primary lesions. Patients with stage IV melanoma generally have a poor prognosis. From the time the metastasis is diagnosed, the median survival is 6-7.5 months, with a 5-year survival rate of approximately 6%. Higgins HW 2nd, Lee KC, Galan A, Leffell DJ. Melanoma in situ: Part I. Epidemiology, screening, and clinical features. J Am Acad Dermatol. 2015 Aug. 73 (2):181-90. [Medline]. Siegel RL, Miller KD, Jemal A. Cancer statistics, 2016. CA Cancer J Clin. 2016 Jan. 66 (1):7-30. [Medline]. Liu V, Mihm MC. Pathology of malignant melanoma. Surg Clin North Am. 2003 Feb. 83(1):31-60, v. [Medline]. Rigual NR, Popat SR, Jayaprakash V, Jaggernauth W, Wong M. Cutaneous head and neck melanoma: the old and the new. Expert Rev Anticancer Ther. 2008 Mar. 8 (3):403-12. [Medline]. Goldstein AM, Dracopoli NC, Engelstein M, Fraser MC, Clark WH Jr, Tucker MA. Linkage of cutaneous malignant melanoma/dysplastic nevi to chromosome 9p, and evidence for genetic heterogeneity. Am J Hum Genet. 1994 Mar. 54(3):489-96. [Medline]. [Full Text]. American Cancer Society. Cancer Facts & Figures 2016. Available at http://www.cancer.org/acs/groups/content/@research/documents/document/acspc-047079.pdf. Accessed: April 1, 2016. New Zealand Guidelines Group, Australian Cancer Network. Clinical Practice Guidelines for the Management of Melanoma in Australia and New Zealand. [Full Text]. Holman CD, Armstrong BK. Cutaneous malignant melanoma and indicators of total accumulated exposure to the sun: an analysis separating histogenetic types. J Natl Cancer Inst. 1984 Jul. 73(1):75-82. [Medline]. Weinstock MA, Sober AJ. The risk of progression of lentigo maligna to lentigo maligna melanoma. Br J Dermatol. 1987 Mar. 116(3):303-10. [Medline]. Schiffner R, Schiffner-Rohe J, Vogt T, Landthaler M, Wlotzke U, Cognetta AB, et al. Improvement of early recognition of lentigo maligna using dermatoscopy. J Am Acad Dermatol. 2000 Jan. 42(1 Pt 1):25-32. [Medline]. American Joint Committee on Cancer. Clinical cancer staging poster: Melanoma of the skin staging. 7th ed. [Full Text]. Kallini JR, Jain SK, Khachemoune A. Lentigo maligna: review of salient characteristics and management. Am J Clin Dermatol. 2013 Dec. 14(6):473-80. [Medline]. Higgins HW 2nd, Lee KC, Galan A, Leffell DJ. Melanoma in situ: Part II. Histopathology, treatment, and clinical management. J Am Acad Dermatol. 2015 Aug. 73 (2):193-203. [Medline]. Akhtar S, Bhat W, Magdum A, Stanley PR. Surgical excision margins for melanoma in situ. J Plast Reconstr Aesthet Surg. 2014 Mar. 67(3):320-3. [Medline]. Hedblad MA, Mallbris L. Grenz ray treatment of lentigo maligna and early lentigo maligna melanoma. J Am Acad Dermatol. 2012 Jul. 67(1):60-8. [Medline]. [Guideline] National Comprehensive Cancer Network. NCCN Clinical Practice Guidelines in Oncology: Melanoma. Version 2.2016. NCCN. Available at http://www.nccn.org/professionals/physician_gls/pdf/melanoma.pdf. Accessed: April 1, 2016. Mora AN, Karia PS, Nguyen BM. A quantitative systematic review of the efficacy of imiquimod monotherapy for lentigo maligna and an analysis of factors that affect tumor clearance. J Am Acad Dermatol. 2015 Aug. 73 (2):205-12. [Medline]. Kunishige JH, Brodland DG, Zitelli JA. Surgical margins for melanoma in situ. J Am Acad Dermatol. 2012 Mar. 66 (3):438-44. [Medline]. Stevenson O, Ahmed I. Lentigo maligna : prognosis and treatment options. Am J Clin Dermatol. 2005. 6(3):151-64. [Medline]. McKenna JK, Florell SR, Goldman GD, Bowen GM. Lentigo maligna/lentigo maligna melanoma: current state of diagnosis and treatment. Dermatol Surg. 2006 Apr. 32(4):493-504. [Medline]. Bub JL, Berg D, Slee A, Odland PB. Management of lentigo maligna and lentigo maligna melanoma with staged excision: a 5-year follow-up. Arch Dermatol. 2004 May. 140(5):552-8. [Medline]. Gross EA, Andersen WK, Rogers GS. Mohs micrographic excision of lentigo maligna using Mel-5 for margin control. Arch Dermatol. 1999 Jan. 135(1):15-7. [Medline]. Etzkorn JR, Sobanko JF, Elenitsas R, Newman JG, Goldbach H, Shin TM, et al. Low recurrence rates for in situ and invasive melanomas using Mohs micrographic surgery with melanoma antigen recognized by T cells 1 (MART-1) immunostaining: tissue processing methodology to optimize pathologic staging and margin assessment. J Am Acad Dermatol. 2015 May. 72 (5):840-50. [Medline]. Clark GS, Pappas-Politis EC, Cherpelis BS, Messina JL, Möller MG, Cruse CW, et al. Surgical management of melanoma in situ on chronically sun-damaged skin. Cancer Control. 2008 Jul. 15(3):216-24. [Medline]. Hazan C, Dusza SW, Delgado R, Busam KJ, Halpern AC, Nehal KS. Staged excision for lentigo maligna and lentigo maligna melanoma: A retrospective analysis of 117 cases. J Am Acad Dermatol. 2008 Jan. 58(1):142-8. [Medline]. Trotter SC, Sroa N, Winkelmann RR, Olencki T, Bechtel M. A Global Review of Melanoma Follow-up Guidelines. J Clin Aesthet Dermatol. 2013 Sep. 6 (9):18-26. [Medline]. Albert VA, Koh HK, Geller AC, Miller DR, Prout MN, Lew RA. Years of potential life lost: another indicator of the impact of cutaneous malignant melanoma on society. J Am Acad Dermatol. 1990 Aug. 23(2 Pt 1):308-10. [Medline]. Koh HK, Michalik E, Sober AJ, et al. Lentigo maligna melanoma has no better prognosis than other types of melanoma. J Clin Oncol. Sep 1984. 2(9):994-1001. [Full Text]. Lachiewicz AM, Berwick M, Wiggins CL, Thomas NE. Survival differences between patients with scalp or neck melanoma and those with melanoma of other sites in the Surveillance, Epidemiology, and End Results (SEER) program. Arch Dermatol. 2008 Apr. 144(4):515-21. [Medline]. Smith C.L. Basic Confocal microscopy. Current Protocols in Molecular Biology. 2008. 14:11:1-18. The authors and editors of Medscape Reference gratefully acknowledge the contributions of previous authors Broc L Pratt, MD, and Antony J Charles, MD, to the development and writing of the source article.